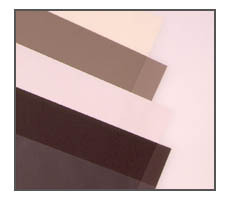 A range of projection screen materials, each with special technical properties. All screens are designed for excellent colour rendering and good contrast with a wide range viewing cones. Rosco screens are specified by major opera houses and theatres around the world. All screens are durable, washable and inherently flame retardant and should be viewed from the matte side to help minimize the unwanted effects of ambient light. Screens are shipped folded in boxes via UPS, FedEx or common carrier (depending on size). Certain screens can be shipped rolled on a core if specified by the customer. Rosco screens should be shipped and stored at temperatures between 40°F and 85°F. If screens are very cold they must be allowed to warm slowly to room temperature before unpacking or cold cracking may occur. Screens should never be stored folded. 1 Pound per sq. yd. A slightly opaque, light grey screen for a wide variety of uses. For projection it is ideal for situations with high ambient light, particularly in outdoor installations because the high light transmission of the screen allows the image to compete with bright ambient light. 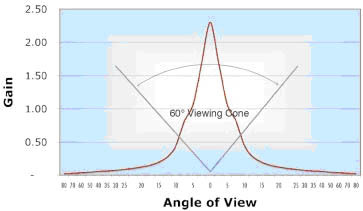 Care should be exercised in avoiding the line of sight between the viewer and the projector, however, due to "hot spotting". Light Translucent screen can also be used as bounce drops and diffusion materials. Our most versatile screen. Its milky white colour makes for equally bright, crisp images whether front or rear projected. This means a designer can cross fade between front and rear projections unnoticed. 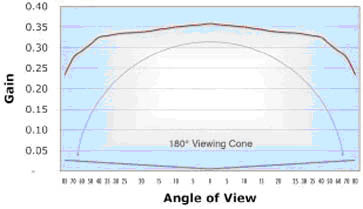 Twin White's wide viewing cone assures everyone in the audience an undistorted image. Ambient light can be a concern so take care when lighting around the screen to minimize bounce light. Best when used where there are high quantities of ambient light. The dark grey colour comes to life with fine detail resolution when back lit with a bright image. The colour makes the screen inconspicuous within the framework of a set. 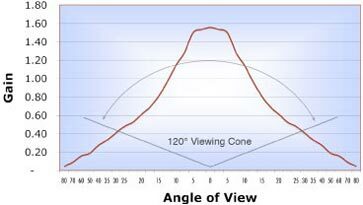 Light transmission is 6% but the high contrast between light and dark make for an image that appears much brighter. Black is particularly well suited for ballet and opera where the dark surface absorbs the reflections of follow spots from the floor. Has many of the same advantages as Black screen but with double the viewing cone to accommodate a wider audience. The colour blends the screen into the scenery and provides true-to-life image colour and clarity with higher transmission and a brighter image. A heavy, crystal clear material that is used primary as a foil for dramatic lighting effects. It is not designed for the projection of images. 2 Pounds per sq. yd.